The unique dome on top of the Legislative Building in the City of Regina, Saskatchewan overlooks the beauty of the blossoming flower gardens known as the Queen Elizabeth II Gardens. 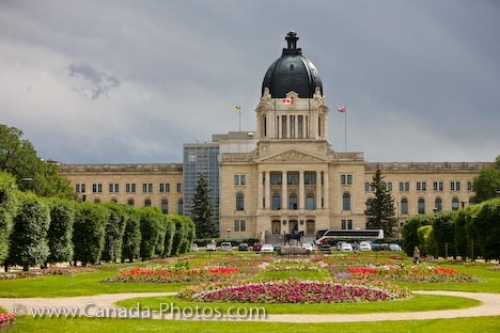 At the front of the Legislative Building in the City of Regina, Saskatchewan, a beautiful park like setting named the Queen Elizabeth II Gardens displays its assortment of color during the spring and summer. Various pathways lead around the gardens where people can enjoy the beauty of each blossoming flower and the aroma filling the air. At the opposite end of the blossoming flower gardens, a statue of Queen Elizabeth II on horseback, placed here in her honor in 2005, overlooks the area, all which is towered over by the Legislative Building. Construction on this architectural landmark began in 1908 and today it is still one of the the most important buildings in the City of Regina in Saskatchewan. The Legislative Building attracts many tourists but the Queen Elizabeth II Gardens are used daily by walkers, runners, bikers or people wanting to stroll amongst the blossoming flowers. Picture of the blossoming flower gardens situated in front of the Legislative Building in the City of Regina, Saskatchewan.